only for the purpose of admission to postgraduate programs, achieving habilitation, employment in a research or teaching position at one of the institutions or the units mentioned above, according OMENCS no. 5923 / 06.12.2016 approving the methodology for the recognition of PhD diploma and doctorate title in science or in a professional field, obtained abroad. PhD degrees obtained from universities in third countries other than those in the list of prestigious universities. the doctoral degrees from the Republic of Moldova will be accompanied by the Certificate of authenticity issued by the National Agency for Quality Assurance in Education and Research (ANACEC), in original or in a copy conforming to the original certified at CNRED headquarters. 1. Hague Apostille is requested for diplomas from countries which are parties to the Hague Apostille , issued by the competent authorities in the issuing countries. Hague Apostille Convention is requested for diplomas from Italy, Greece, Spain, Portugal and Cyprus. 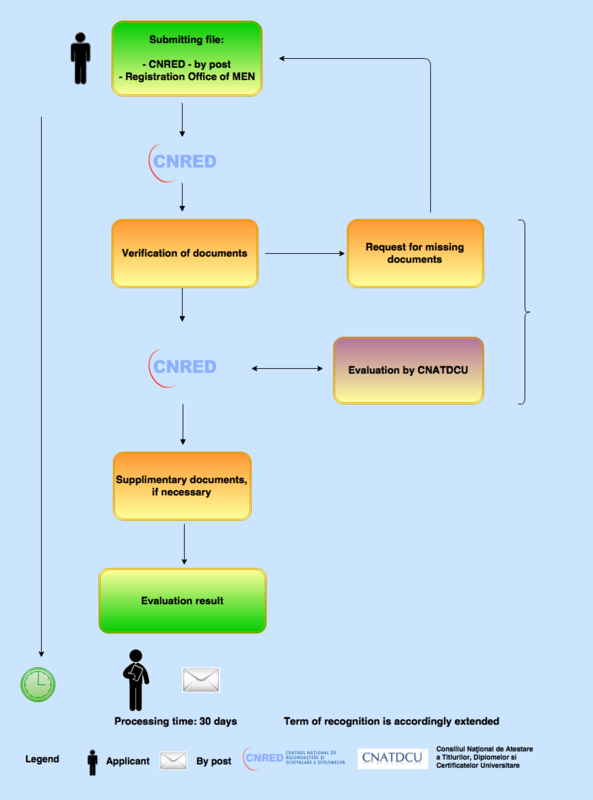 CNRED evaluate and issue a final decision within 30 working days of the submission of the complete file. This deadline may be extended in additional verifications or where CNRED submit the file for evaluation to the National Council for Attesting Titles, Diplomas and Certificates (C.N.A.T.D.C.U.). In case of loss, complete destruction or partial deterioration of the recognition certificate, a duplicate may be issued, if the documents which allowed the issuing of the said certificate are still available in the archive. CNRED’s decision can be appealed through the Ministry of Education’s Registration Office or by post, within 30 days from the day the decision reached the applicant. The procedure for recognition of doctorate diploma and of PhD. in science or in a professional field, obtained abroad can be viewed in Point of Single Contact and Electronic Procedures.